MANNY CHARLTON is the guitarist most associated with Scottish rockers NAZARETH, who also produced their big seller “Hair of the Dog” and a few more. In 1990 Manny left NAZARETH. At first he played the Scottish live circuit and released a solo album “Drool” in 1997. The next year Manny relocated to America. Over there he formed THE MANNY CHARLTON BAND, two albums followed before yet another solo album, “Say the Word” in 1994. That brings us up to these albums released in 2005 and 2006 respectively. Manny must have been in the mood for covers as the lion part is famed or his personal favourites of big names from the past. “Sharp” has the tone of a home studio job, at least to me. Manny handles almost everything on it, except the drums and percussions, which are done by Steve Froese. The albums opens with what Manny refers to as a must back in the 1960´s club circuit, “Muddy Water”. ELVIS, JIMI HENDRIX, ARTHUR ALEXANDER, and even EMMY LOU HARIS get reworked in slow blues and early Rock´n´Roll fashion. If you like the new versions or not what lingers is the sensitive guitar work. The vocals are, well let´s say they are not close to Dan McCafferty (NAZARETH´s original vocalist). I will remember the version of “Rollin´n´Tumblin” (also reworked by JEFF BECK once), the cosy instrumental “Burnt Sienna” and the eternal “Please Don´t Judas Me” by Nazareth. 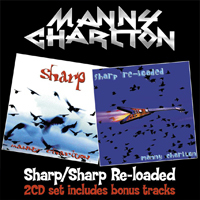 “Sharp Re-loaded” is more of the same, with a small percentage of NAZARETH and original material. First up is “The Chain” by FLEETWOOD MAC (off “Rumors”), followed by NAZARETH´s own, the surprising “Cinema”. I wish he´d left out “Swallow”, which is like a dire and the DYLAN take on THE BEATLES´ “Norwegian Wood”, which is far too slow. The album fares better with the likes of “Fallen Angel” (NAZARETH) and Bo Diddley´s “Who Do You Love”, that comes across sounding a bit like the blues genre´s take on punk. If you like reworks and if you´re into 60´s blues and Rock´n´Roll thai sia the album for you. Otherwise Manny has done better both with and without NAZARETH.